Sometimes answering apparently harmless questions on instant messaging can have unexpected results. In particular, I was telling about Danbooru Client to someone and a question popped up “Why don’t you support pages?”. It seemed a nice idea, so I branched off the code (yay for git!) and started working on it. Well, it took me more than a month to get this thing done… I didn’t spend every day coding, but it was a challenge. Glad it’s over now, which means that Danbooru Client 0.5 is finally available. Grab it at the usual place on kde-apps.org. Support for translations (thanks to Pino “pinotree” Toscano for the help): the tarball now contains a .pot file which can be used for translating Danbooru Client. If you make a translation, send the .po file my way and I’ll include it in the next version. Improve the image download dialog. 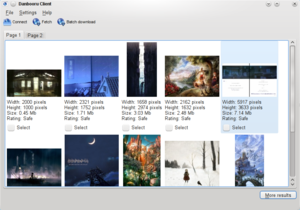 On recent KDE SC versions (4.4 beta 2 and onwards) there are some painting issues with regards to the thumbnails, but I’m not sure if the fault is in PyKDE4 or in the underlying libraries. Nothing too bad, luckily: hovering the thumbnails or giving focus to the thumbnail view should be what’s needed. Comments and suggestions are always welcome, so don’t hesitate to drop me a line.